Just come back from an interesting field trip (ENERGY 101A: Energizing California) to different types of power plants. It is very interesting to learn all sorts of knowledge that are related to our daily life. I created a map on Google map, see here. California electricity generation in 2013 (exclude imports) is 200,077 GWhr, about 23GW power on average. Per capita usage: 750W or 0.75kW every person. California electricity generation in 2013 by source: 51% from natural gas, 11.8% from hydroelectric, 6.4% is from wind (huge increase recent years), 1.4% is from biomass. Other significant sources: geothermal, and nuclear. In US, California plays a role of “environment forerunner”. Many energy saving or environmental protection measures were first taken place in California. It is California actually drive the US standard up. Examples include the energy star system and higher environment standards. The federal sometimes “wait” for California standard to implement and then try to work on the other states in US. Basics: about 100 GE 1.5MW wind turbines, capacity factor 28%, so on the average about ~30MW power generated. 10 full time employees. Fully automated wind turbine rotor: the angle of the blade is adjusted to either parallel to the wind or at certain degree to turn the turbine on and off. The manager just pushed one button to shut down the turbine smoothly. The wind turbines placement: they are randomly scattered around the hills where there is lots of wind. As in late years, the wind has becoming more irregular. Capacity 24MW power (quite continuous). It takes in 600-800 tonnes of biomass material per day. Tens of tonnes of ashes after burning can be used as things like fertilizer, construction material. There are 30 biomass plants in California. The main environmental benefit is that there is almost no pollution compared to burning those biomass materials in open air. Sources: construction wastes, agricultural things, wood pieces, saw dust, grains, little branches, pretty much any waste with high organic content. Biomass material will decompose naturally. Fresh wood pieces (yellowish) will become dark (dark or black) as time goes. 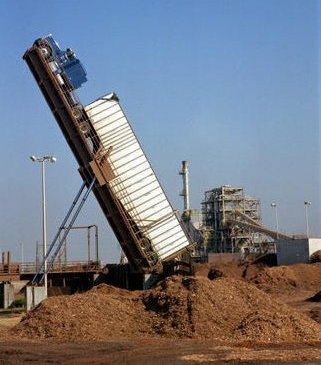 Piled up biomass will look “smoky” as they decomposing!! “Wild fire” may be developed if they are overheat. Trucks will be lift up to 75 degree angle (!) to pour materials into the feeding machine. Looks like launching the truck rocket! See here. Unfortunately, the transportation of biomass from cities, forests to the biomass power plant is so high, so the electricity price is not favorable for them. So they have to shut down the plant. Water intake, wood plates to filter things out. Generates electricity from 1895-1952. Four generators. Total of 3MW power (equivalent to 2 wind turbines…). Now, it is a State Park/museum. Operates until the end of WWII. So it has the chance of survival (not being taken for military used). There is a telephone booth in the power plant. One need to literally jump into the booth and wear rubber gloves to make/take phone calls to avoid the electric shock!! First built Folsom prison, then the prisoners did the construction works. Natural gas field by California Resources Corp. Basics: 150 gas wells ranging from 3000-12000 ft deep. Gas produced all sent to power plant, generates about 25MW electricity. Natural gas is the least carbon intensive fossil fuel. By contract, the six land owners would have direct access to the gas produced from the underground (not through PG&E). Causing extra work for the petroleum company. Land leases are for 99 years. There is a “scrapper” separates solids and liquids from the gas, then three-stage compression facilities compress gas into 800psi, and transported to power plant through the pipeline. Because of the low oil price and gas price, the production is actually low. No new wells being drilled. Of course no drilling engineers, completion engineers, neither reservoir engineers. They are mainly in Bakersfield. Only operation supervisor was introducing these to us. Newly replaced “smart”meters made by ABB can be remotely controlled on an iPad! The spirit of IoT!! The Delta area (Sacramento–San Joaquin River Delta) is below sea-level. And water needs to be pumped out to make it dry and suitable for agriculture. Water is being pumped from the river out to South California. That became a huge debate between the water shortage in South California and the devastating ecology of the Delta area. The whole pumping system (from Delta to South California) uses about 800MW electricity!!! Human are reversing many many hydroelectric power plants. It is a really fun trip to have. Also, it is so important for people who are so used to modern technology to understand what are the cost of the benefits, to understand where electricity comes from, what are limitations, etc. In that way, people can cherish our mother nature more.